As per information available as on 24th July, 2017, 18 States and 7 Union Territories have discontinued the practice of interview in recruitment for lower level posts. The objective of discontinuation of interview in selection process at lower level posts is to curb corruption, more objective selection in transparent manner and substantially easing the problems of poor aspirants. Union Territory Administration of Daman & Diu has informed that it has benefitted them economically by way of savings on account of non-application of Travelling Allowance/ Daily Allowance and other expenditure involved in calling candidates for interview. Further, Union Territory Administration of Lakshadweep has informed that local aspirants have economically benefitted from this initiative of the Government. The States of Arunachal Pradesh, Jammu & Kashmir, Haryana, Mizoram, Tripura, Uttar Pradesh and West Bengal are yet to decide about discontinuation of interview in the recruitment of lower level posts. The States of Sikkim and Meghalaya have not adopted the process of discontinuation of interviews in recruitment to lower level posts. However, information regarding the State of Nagaland is not available. 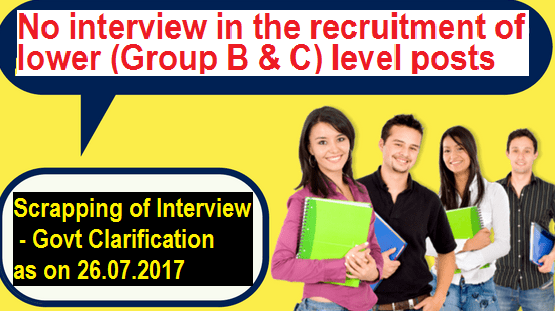 Further, it has been informed by the State of Odisha that steps have already been taken to implement scrapping of interview system concerning junior level posts (Group B & C) of all Departments. This was stated by the Minister of State for Personnel, Public Grievances and Pensions and Minister of State for Prime Minister’s Office Dr. Jitendra Singh in a written reply to a question by Shri Naranbhai Kachhadiya in the Lok Sabha today.